Whether you prefer articles read to you while you do something else or trying to grasp a new foreign language or even for specially abled students, TTS (short for text-to-speech) has proved to be very useful. In our previous articles we saw some of the best text to speech apps for Windows and Android. And today, we take a look at some of the best TTS options available for Macs. Before we get too ahead of ourselves and start downloading third party apps, it is very trivial to know that macOS itself comes with a built-in TTS and you can use it anywhere on your computer from the Notes app to any browser. 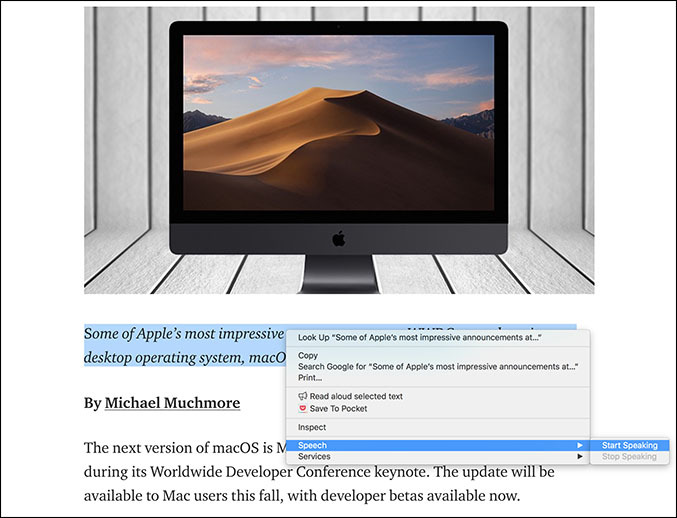 To get started, highlight or select the text which you want to be read and then right click, go to Speech and then to Start Speaking; and your Mac should start reading the text to you. It also supports a lot of other languages other than English and there are a lot of voices to choose from in all the languages. To change the language option simply go to Accessibility > Speech. Although some voices are very robotic, there are a few which aren’t and sound more like a human. But the TTS is far from perfect; it is very basic and barebones and lacks options like pause/play, picking up from a selected word instantly and a lot more. Quick Tip: It blew my mind and might even blow yours to know that the native TTS on Mac also supports converting your text into audio files. Just select the required text, right click and go to Services > Add to iTunes as a spoken track. The text will be converted to an audio track and added to your iTunes library. Overall, the TTS that comes with macOS is very barebones without all the bells and whistles and should be perfect for somebody looking for a basic TTS experience without even buying or installing any third party software. 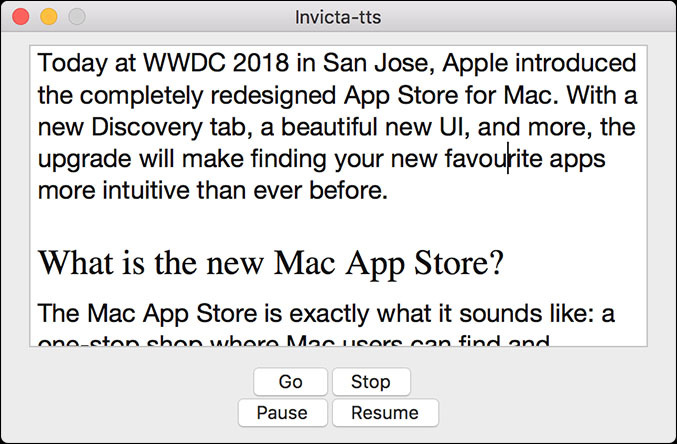 Invicta TTS is a very simple free Text To Speech app available on the Mac App Store. Once you open up the app, it presents you with a text box where you can enter or paste any text which will be then converted to speech. The app is very lightweight and minimal in nature with everything being to the point. Although the app is very basic, unlike the built in TTS of Mac OS, it does add the option of playing or pausing the audio which becomes crucial when listening to long texts or articles. The voice settings cannot be changed but the in built voice does the job pretty good enough. If you need a simple and light TTS app and might be listening to long articles, Invicta TTS does the job pretty well but do remember that it can only read English. The next app on our list is Natural Reader which is an extremely powerful TTS software available not only on Mac OS but also on Windows, iOS, Android and even has an online reader. The app comes in many flavours, each with its fair share of features for the price. The free version comes with basic TTS features along with the ability to read directly from file formats such as Docx, PDF, ePub and Txt. 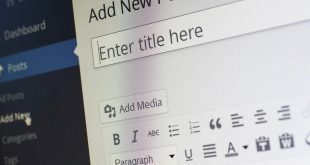 It also has a floating bar which can be used to read text while you are in other applications. 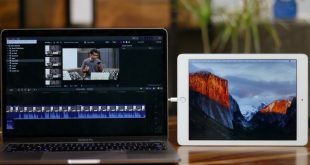 The next option or the Personal version, at a steep $100, allows you to read web pages directly, converting text to audio files and syncing everything between your phone apps. There are also Professional and Ultimate versions which add OCR support and a bunch of natural voices. All the features of Natural Reader definitely come at a price and you should be able to decide whether it is a suit for you with respect to your investment in TTS, but even for a casual user the free version works really well. Overall, Natural reader is not just best text to speech software with natural voices, but since it also support PDF, it’s also a good option for those who are looking for PDF Voice Reader for macOS. Read Aloud is not exactly a stand alone Mac app but instead a Chrome extension which might appeal to some people. Considering how many posts and articles are read on the internet everyday, we had to include Read Aloud. 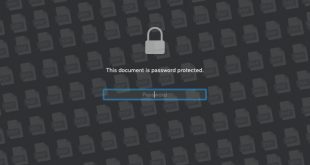 It is completely free and once you install it, its icon will appear in the extension bar which you can now use to read any webpage or any online article, just by a single click. When it is in work, you get a play/pause button along with a forward or rewind button which can be used to advance or backtrack paragraphs. Considering it is free, the voice options are really good and feel very natural and premium. Suggesting Read Aloud is very straight forward; if you are someone who reads a lot on the internet and are looking for a free TTS software for that, nothing beats Read Aloud. Capti Voice is probably the most polished and well rounded TTS software available for the Mac and the award are only there to justify that. Starting off, Capti Voice uses your browser for the app to function instead of a stand alone Mac application. Don’t worry, you can still use it while you are offline as it stores all its data locally and personally I have had no issues. Capti Voice has a subscription based model and even the free version has a lot to offer from various file format supports to text search while the premium versions add features like creating playlists, OCR Support and intelligent dictionary lookup. The voices offered across all the platforms are very high quality and commendable. Quick Tip: Don’t forget to use the Chrome extension which allows you to save articles or webpages to be read later by Capti Voice. 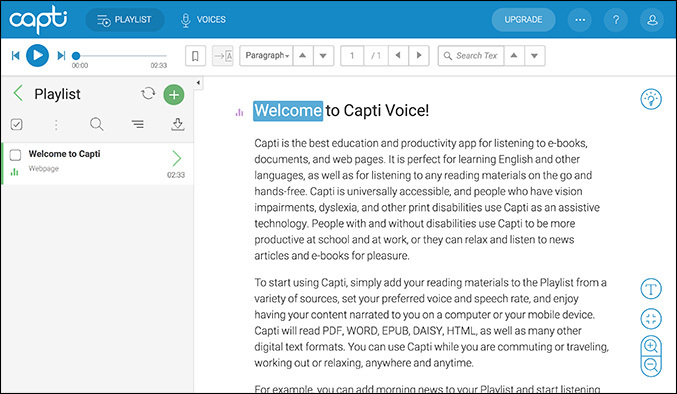 Overall, Capti Voice is a really compelling app with features packed to the brim and is very similar to natural Reader but with a subscription based model. It is really the best TTS experience you can get on Mac OS. CereProc has some of the most natural sounding computer speeches available on the market, which you can use to replace the default voice on your Mac (also available for other platforms). There are a lot of high quality voice packs to choose from and each costs around $35. Zamzar is a free online service which you can use to convert your text to audio files or mp3s. Unlike the iTunes spoken track which you can use only on Apple devices, you can use it on any platform without any hassle. So these were some of the TTS software available on the Mac and we hope we made your decision a little bit easier. If you are someone who reads mainly on the internet, Read Aloud is by far the best free option. Although a little limited, the built-in TTS feature seems to work just fine, but it can be a pain for long stretches of texts or long articles for which there is Invicta which is also free. Natural Reader and Capti Voice both are spectacular TTS apps with a lot of plans to choose from, but I guess what it comes down to is the paying model. Natural reader is a one time purchase and should be better if you feel you will be invested in TTS for a long time whereas Capti Voice follows a subscription based model also with a one week free trial. Thanks for reading and do comment below which one is your favorite TTS app on Mac OS.